The Oakland Athletics entered today with the best record in all of baseball but to them, that was not enough. 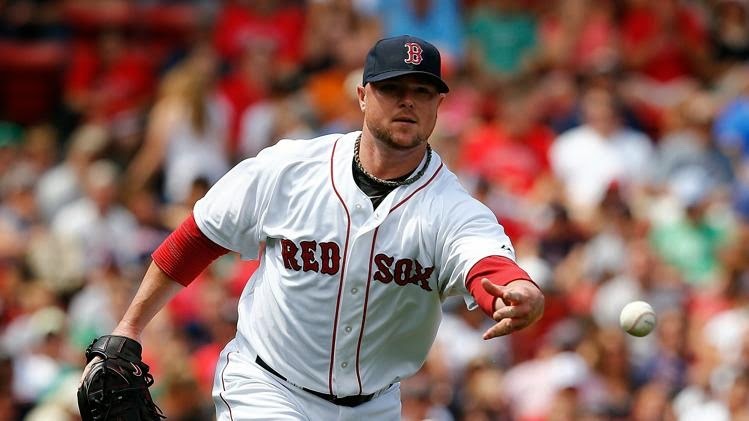 Therefore, they went out and made the first bold move of the trade deadline in acquiring Red Sox ace Jon Lester as well as Johnny Gomes for Yoenis Cespedes and a pick as first reported by Yahoo's Jeff Passan. With a bold move such as this, as well as the one to acquire Jeff Samardzija and Jason Hammel from the Cubs early this month, A's general manager Billy Beane is making it very clear how high his club is aspiring this October. One of the common things that people say about Beane and his philosophy when trying to discount it is that he has not found great success in the postseason. Oakland has gotten out of the divisional series just once during his tenure and that came in 2006 when they were swept in the 2006 ALCS by the Detroit Tigers. Of course, it's not that fair a criticism in my opinion but alas, it exists. Now, Beane has put his club, one that had a strong pitching staff already, potentially over the top. Having to part with a talent such as Cespedes for what will be a rental piece in Lester is a tough pill to swallow, but not that tough considering that Cespedes will be a free agent after next season and would have been difficult for Oakland to retain him anyways. It also may hurt their lineup as Cespedes is an All-Star and one of the few sources of power in the A's lineup. However, having a guy like Lester at the top of the rotation is extremely valuable considering how strong of a playoff pitcher he has been throughout his career. Oakland has a deep rotation but it was also one that was short on playoff experience, which Lester now solves. It also does not hurt that Lester has been having a tremendous season and perhaps the best one of his career as he is at career bests for ERA (2.52), ERA+ (155), Fielding Independent Pitching (2.62), Expected Fielding Independent Pitching (3.03), walk rate (5.5), among others. Plus, he is moving from a strong hitting ballpark in Fenway Park to a great pitchers' park in the immortal O.co Coliseum. Oakland will now sport a playoff rotation of Lester-Sonny Gray-Scott Kazmir-Samardzija as well as a five-man rotation of Lester-Gray-Kazmir-Samardzija-Hammel with Jesse Chavez, who has been coming back to earth of late, the odd man out. Actually the true odd man out was Tommy Milone who was already moved to Triple-A and will now head to Minnesota for Sam Fuld. That Milone-Fuld deal looks a little crazy on first glance, but it may not be that wild on closer inspection. Milone has really struggled in Triple-A and Fuld helps the team more right now. He will play centerfield with Coco Crisp being hurt and he should make for a solid left field platoon with Gomes. We saw it when they took a big chance trading Addison Russell for Samardzija and Hammel, a move they may come to regret down the line, and we are seeing it now: Oakland is going for it all. But unfortunately for them, they are not the only one in that boat.